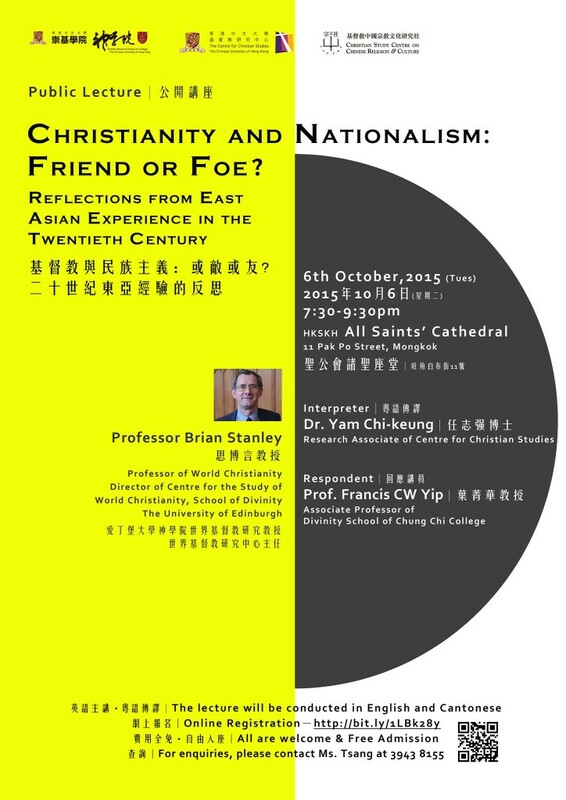 Hong Kong Public Lecture: Christianity and Nationalism: Friend or Foe? Christianity and Nationalism: Friend or Foe? ‘Should a Christian be a nationalist?’ In the early 20th century, nationalists in Asia were often sympathetic to Christianity as a potential route to modernization. Even after the First World War, there was a brief period in which US President Woodrow Wilson’s apparent enthusiasm for national self-determination appealed to many political leaders in Asia. From the early 1920s, however, nationalism and Christianity were increasingly set in opposition in Asia, especially in China. Korea is the most obvious exception to this trend. The lecture will explore why this was so, and discuss the implications for Korean Protestantism of this growing convergence between nationalism and Christianity. The lecture will be conducted in English with Cantonese interpretation. All are welcome & Free Admission. For enquiries, please contact Ms. Tsang at 3943 8155. Register online. This entry was tagged Asia, China, Christianity, Korea, Nationalism, Public Lecture, World Christianity by CSWC. Bookmark the permalink.